Aunt Jeanie's Famous Homemade Freezer Apple Sauce Recipe! It’s apple season, and we couldn’t be happier that one of our loyal readers has shared her family’s famous homemade freezer apple sauce recipe for all to enjoy! To be exact, it is actually her Aunt Jeanie’s famous homemade freezer apple sauce recipe! This month, as Autumn settles in, we thought it was the perfect time to share a timely apple sauce recipe from Candice Cromine. Candice hails from the great state of Washington. Apples are a big deal in Washington. Apple season begins near the mid-point of August, and runs all the way into November. According to the Washington State Apple Commission’s website, there are about 175,00 acres of apple orchards in the state. And combined, they produce over 2.5 million tons of apples each year! Today’s recipe, from Candice Cromine, comes straight from Wenatchee Valley, which is in the heart of Washington’s apple country. My Aunt and Uncle had a small little orchard in the valley, every year my Aunt Jeanie would make apple sauce from all of the seconds from the trees. The seconds were still amazing apples, but had a blemish here or there. It was hard to sell them in the markets, but they made amazing apple sauce. Aunt Jeanie always said the key to great apple sauce was making it from different apples. She would peel, core and cook down a mix of Golden Delicious, Fuji and Cortland apples to make hers. She would cook down a huge pot on the stove, and then let it cool. Jeanie never canned her apple sauce. Instead, she placed it into quart freezer boxes to have anytime. We always referred it her “famous freezer apple sauce recipe.” I always loved having it after it had just barely thawed out. The little ice crystals and the sugary-sweet apple flavor was simply divine! You can use any mix of good saucing apples, but Jeanie always used an equal mix of Golden Delicious, Fuji and Cortland apples. We have experimented with other apples with good success, but those three varieties seem to work perfectly together. 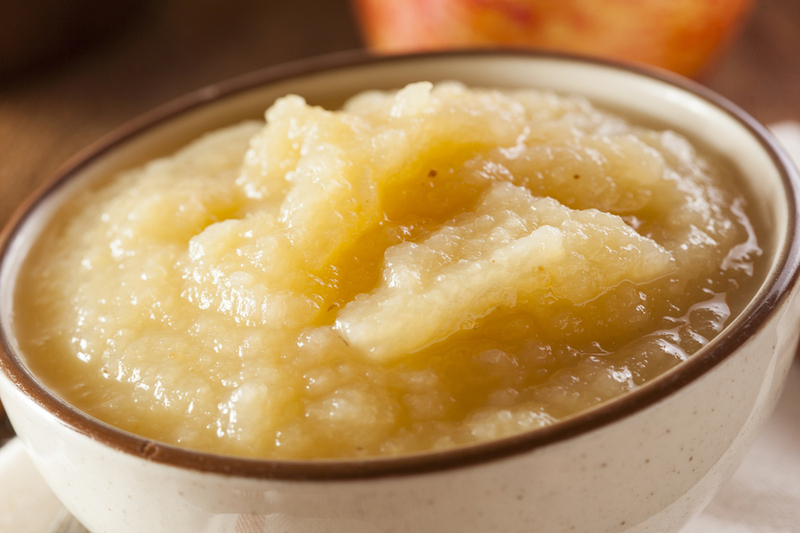 Be sure to use soft apple varieties to make apple sauce. Crisp apples take a long time to cook down and usually do not have the flavor. One thing is for sure, a hand cranked peeler and corer is a must if you are going to make it often! It makes quick work of preparing the apples. Here is our family recipe from Jeanie we still use today. Peel, core and slice up the apples into small chunks. The smaller the chunks, the quicker the apples will cook down. Add all of the ingredients together into a single large pot. Cook down on medium-low to medium heat to prevent the apples from burning on the bottom of the pot. Stir every 5 to 10 minutes. An apple peeler makes quick work of preparing apples. Aunt Jeanie used a potato masher to smash the apples into apple sauce. We use an immersion blender to blend it together today. It is a bit quicker than the old potato masher method for sure! The key is to not over blend. We like to have a bit of small chinks here and there. I think it gives it more flavor, but it might be because it reminds me of Aunt Jeanie’s. As soon as it cools, it can be placed into freezer boxes or even bags to freeze. The apple sauce will store fresh in the refrigerator for a few weeks as well. It can be stored in the freezer for 6 months, although our freezer apple sauce never lasts that long! March 21, 2018 ThisIsMyGarden Comments Off on Dogwood Trees – Top Tips For Planting And Maintaining!